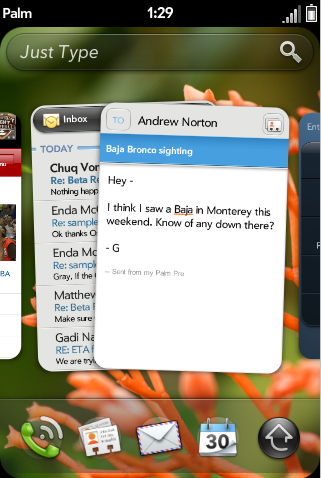 When webOS 2.0 lands later this year, it’s going to bring with it some major enhancements to Universal Search. So major, in fact, that Palm is changing the name to Just Type to reflect that there’s more to it than just search. So what exactly does that entail? As we surmised earlier this month, app developers will now be able to build plug-ins for Just Type that will enable users to search just about anything. Not only can search queries be added for websites (as we’ve seen done through homebrew), apps can now register with Just Type so that users can launch a search of info in that app directly from the webOS card view. Be it checking a medication in ePocrates or looking up a friend’s Facebook profile, the possibilities of extension of search in Just Type are wide open. But like we said, search isn’t all there is to Just Type in webOS 2.0. The other, and if you as us more exciting, addition is that of Quick Actions. This is the reason behind the name change, and it’s one that will change a lot of user behaviors. Quick Actions allow users to trigger actions other than search from Just Type. As a hypothetical example, one could punch up a 140-character pithy comment and post it to Twitter without even opening an app. Or you could jot a quick note-to-self and add it to your Tasks list, all from Just Type. More so than the expandable search options of Just Type, Quick Actions blows open the doors for a new level of seamless multitasking... essentially Quick Actions in webOS 2.0 will allow you to do things in apps without ever having to launch the app. We could go on all day about the possibilities of Quick Actions (compose email, set alarms, create calendar appointments, Facebook status updates, Foursquare check-ins, send text messages, update your blog, etc), but we won’t. Think of it this way: if it’s something you have to type to accomplish, then Quick Actions could enable you to do it faster than ever before. There’s something else interesting to note about Just Type: a search box has been added to card view in webOS 2.0 (it says simply “Just Type”). This new permanent placement serves one very defined purpose: it drastically increases discoverability. Many of us can attest to running into a normal webOS user that wasn’t even aware of the just start typing existence of Universal Search (or the just start typing search in any manner of apps). By putting the Just Type search box in such a prominent position, Palm is ensuring that one of the best features of webOS doesn’t go unused by those who would benefit the most. There’s a second and more intriguing possibility behind the permanent placement, and it’s something we touched on in our overview of webOS 2.0’s newly announced features: “just start typing” is impossible if your device doesn’t have a keyboard. While we would love for Palm to figure out a way to release a webOS slate with a keyboard, we aren’t too optimistic of that actually happening. Without a keyboard, the aforementioned slate would have no way to launch a Just Type search if there weren’t a search box to tap on and trigger the appearance of a virtual keyboard. Enough speculation, let’s get down to it. Just Type with Quick Actions is poised to change the way we use our phones, and most certainly for the better. We want to know: what searches do you want to see added to Just Type, and just how do you see yourself using Quick Actions?